What exactly is métiers d’art? Time-worn techniques used by watchmakers to create decorative watches that put aesthetics before functionality. An extremely time-consuming technique, enamelling involves applying multiple layers of melted soft glass onto a dial with a goose quill. The dial is heated repeatedly in between coatings until the desired colour and vibrancy is achieved. Attention to detail is essential: Should the artisan make one wrong move–overheat the dial, for example–the enamel will crack or produce gas bubbles and… boom! The whole process has to be restarted from scratch. The most common forms of enamelling are: grand feu; grisaille; plique-à-jour; champlevé; and cloisonné. One of the better-known methods in watchmaking, engraving transforms raw metal into artwork. An artisan uses a burin (a handheld steel tool) to carve a motif or pattern into the watch. Too much, and the dial will become too thin; too little, and the three-dimensional effect is lost. Achieving this delicate balance takes time and patience. 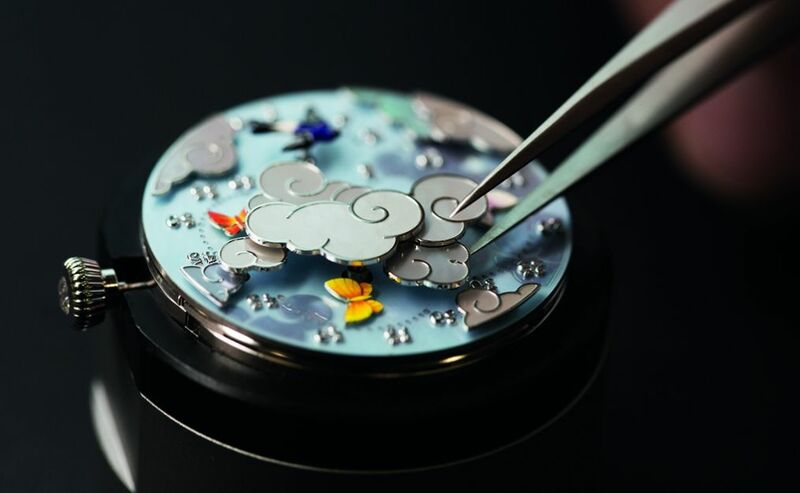 Watchmakers including Vacheron Constantin and Piaget regularly employ engraving, and both have created timepieces that depict everything from jungle cats and hot-air balloons to flowers and world maps. Shakudō is an ancient alloy that dates back several centuries to the Japanese Nara period, during which time it was used for Samurai sword fittings. Typically 4 to 10 per cent gold and 96 to 90 per cent copper, the metal is repeatedly dipped into a bath called rokushō, which slowly changes its colour from black to grey or blue. Swiss watchmaker Blancpain notably used the Shakudō technique on its Villeret Métiers D'Art Ganesh watch, which won the prestigious Grand Prix d’Horlogerie de Genève (GPHG) in 2015. There are typically two types of marquetry: feather and wood. For both, an artisan cuts the material into wafer-thin pieces and arranges them to form a distinctive pattern. An exceptionally difficult craft to master, in France there are only a dozen trained feather artisans, including Nelly Saunier who has worked with Van Cleef & Arpels. The maison’s Colibri Indigo timepiece sees a turquoise- and plum-coloured bird mid-flight against an ultra-feminine backdrop of diamonds. Dior’s Grand Bal, meanwhile, uses feather marquetry to evoke the movement of Christian Dior’s haute couture ballgowns, which are exquisitely depicted on the dial. Damascening was first discovered in China around 300 BC, and was later championed in Damascus, Persia and India, before being popularised in Toledo, Spain. Seldom used in the industry because of its complex undertaking, a design is first chiselled onto the watch’s surface. Threads of metal—including gold, silver and steel—are hammered into the paper-thin grooves before being smoothed and polished to surface level. Damascene steel—another way to use the technique—is created by layering several different types of steel on top of one another, thus uniting the various metals’ properties, as seen in Christophe Claret's X-Trem 1 that's ripple-like.